It was a memorable season for the area boys basketball teams. Not only was there plenty of team success, but there were several individuals whose performances were tough to ignore. For those reasons, the 10 players on our 2017-18 All-Herald Boys Basketball Team are the best the area has to offer. The All-Herald First-Team is filled with players responsible for some of the best turnarounds and seasons their programs have had. New Britain was one of those teams. The Hurricanes showed a tremendous ability to spread the ball around, but certainly didn’t lack any stars. After finishing with a 15-5 regular season record and reaching the quarterfinals in the Division II state tournament, they place two players on our first-team. 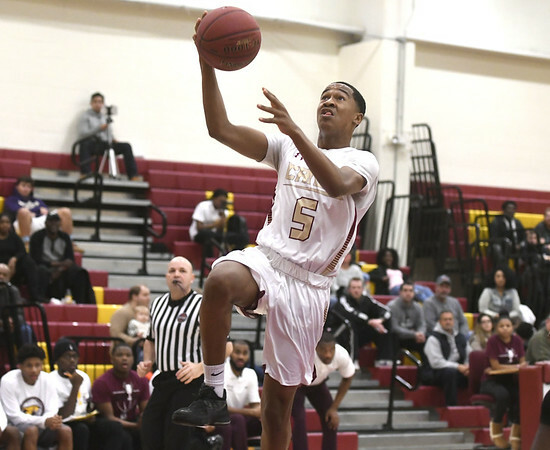 Kareem Brown’s play was a big reason for New Britain’s season, turning in an outstanding senior campaign. The 6-foot-4 forward finished the year shooting 63 percent from the field, recording 8 points and 5 rebounds per game, which helped him earn his first all-conference nod. Joining Brown on the first-team is teammate Thameen Dupree. The sophomore burst on to the scene this season and has the stats to back it up. His 14 points per game led the team. He also averaged 2 steals, 3 assists and 4 rebounds per game to help him earn all-conference honors. With two years of varsity still left to play, the guard will certainly pose plenty of challenges for opponents in the coming seasons. Southington places the third member on our All-Herald First-Team, Andrew Lohneiss. The Blue Knights reached the postseason in back-to-back seasons for the first time since 2011 and the play of Lohneiss was a big reason why. The senior guard led his team with 16.5 points per game (he scored 412 points on the season) and recorded 7.8 rebound per game to guide Southington to the Division III quarterfinals. His performance on the floor earned him not only a spot on the all-conference team, but on the Division III All-State team as well. While Lohneiss had a large impact on the court, he is also a top-notch student with a 97.9 GPA. He has yet to decide where he will be attending college next year. Innovation reached a number of milestones as a program this past season. The Ravens won their conference title and qualified for the state tournament for the first time, reaching Division V quarterfinals. A big reason for that was the play of point guard Carlos Gonzalez. The junior finished out the season with 11.8 points, 2.4 assists and 2.0 steals per game. He was also effective from outside the arc, where he ranked among the top 10 in the state in 3-pointers made. His performance with the Ravens earned Gonzalez an all-conference selection. He is an honor roll student as well. Rounding out our first-team is Goodwin Tech’s Francisco Santiago. The Gladiators went 17-3 during the regular season to secure the fourth seed in the Division IV state tournament with Santiago’s ability to run the point chief among those reasons. Whether showing off his ability to score or getting his teammates involved, Santiago racked up a number of awards. A four-time team captain, he earned his third team MVP award, was first-team all-conference for the third year in a row and participated in the 2018 senior all-star game. A strong student as well, Santiago was on the honor roll yet again. He is currently deciding between New England College, Newbury College and Keuka College. While our All-Herald First-Team is filled will loads of talent, our second-team is another veteran group that can compete with some of the best. Jahfari Newman is New Britain’s representative on the second-team. The senior played a multitude of roles for the Hurricanes and brought strong leadership qualities to the team. Throughout the season, Newman played small forward, power forward and center, showing off his versatility as someone who can score both inside and out, while also being able to rebound with anyone in the state. Newman ended his season averaging 10 points and 5 rebounds per game. Berlin had a lot of inexperienced players entering the year, which led to a slow start before a strong finish. But one of the players that brought some veteran experience night-in and night-out was Mike McCarthy. The senior saved his best season for last. He hit the game-winning shot against Bristol Eastern and earned All-CCC recognition along the way. Also a strong golfer, McCarthy is looking at Mitchell College for golf. Lohneiss wasn’t alone in Southington’s strong season as he got plenty of help from teammate Jeremy Mercier, who turned in a number of quality performances of his own. The forward finds himself on our second-team after a senior year that saw the team captain average 12.0 and 6.5 rebounds per game. Off the court, Mercier is a first-honors student with a 97.6 GPA. He hasn’t decided on where he wants to play in college, but hopes to walk on wherever he goes. But the Blue Knights will certainly miss their two seniors next season. Leonard Okonya is another Innovation player on our list and formed a potent 1-2 punch with Gonzalez that helped the Ravens reach new heights this season. But while Gonzalez was Innovation’s guy from the outside, Okonya proved by a forced from all over the court, particularly in the paint. The junior power forward/center was among the best shot blockers in the state, averaging an eye-popping 4.2 a game. He also averaged 9.1 points, 8.5 rebounds, 1.4 assists and 1.3 steals per game. With numbers like that, it’s easy to see why the Ravens were a basket away from the Division V semifinals. It’s also why Okonya was a first-team all-conference pick. Okonya is also a strong student in the classroom. A high honor roll student with a 4.2 GPA in his junior year, he was an all-academic selection as well. With another season still to go, Okonya’s presence could make the Ravens an even more dangerous team next year. Rounding out our All-Herald Second-Team is Goodwin Tech’s Luis Aguiar. The sophomore small forward did a little bit of everything for the Gladiators this season, whether it was scoring, rebounding or playing defense. One of Goodwin Tech’s top players, he was often a focus for opposing teams. With still two more seasons to go, Aguiar should be a dangerous player to have to go against in the coming years. Posted in New Britain Herald, Berlin, General Sports, Goodwin Tech, Innovation, New Britain, Southington on Tuesday, 10 April 2018 14:24. Updated: Tuesday, 10 April 2018 14:27.